The Historical Society of Haddonfield’s Archives Center and Research Library includes a collection of records from Mount Peace Cemetery in Lawnside, NJ. These records were collected by Bryson Armstead in the 2000s as he worked to document the long history of the cemetery. He connected with families who had long associations with Mt. 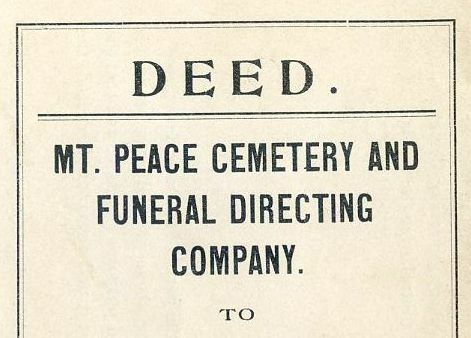 Peace and located the burial register for 1937-1959, select monthly reports of the boards of directors from 1931-1933 and 1935, and more. All of these items are available for public use at the Archives Center during public hours. Update: The Mt. 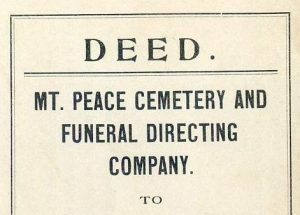 Peace burial register is on loan to the Lawnside Historical Society from September 2017 through October 2018. It will be on display as part of a special exhibit hosted at the Camden County Historical Society.